After brainstorming Memaw’s Monsters in chapter 1. Followed by my experience prototyping my idea in chapter 2. 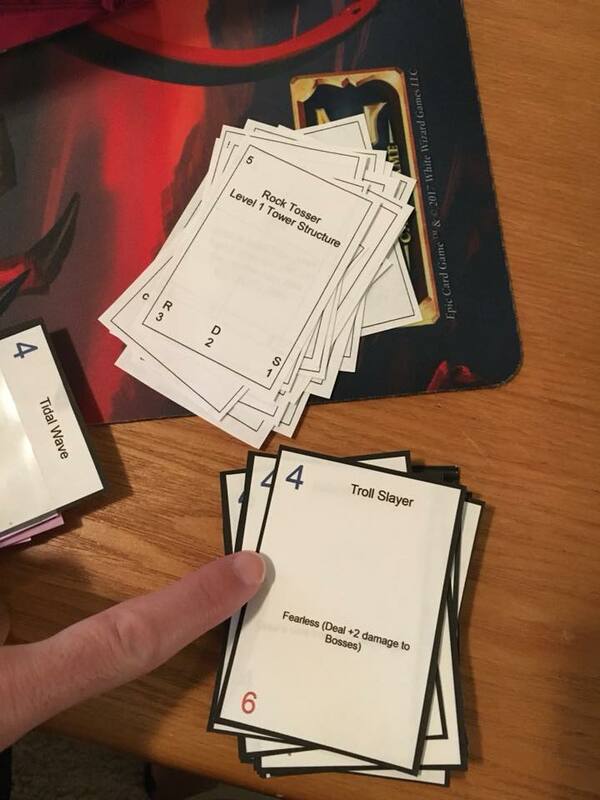 Today I will be talking about playtesting my card game prototype for the first time. Woohoo!! The following are updates I made to the SLG Facebook page about my first weekend of playtesting with my brother, Drew. (6/2/18) Explaining how to play the game at my first play test with my brother. We ended up getting to play a round of Memaw’s Monsters last night! It was exciting getting to finally test out this idea that’s been in my head for weeks now. Drew and I both loved the overall concept. The cards were broken which is normal in a first play test. For example, the defense cards were way underpowered because I made them quickly and didn’t get to put as much thought into the math as if liked. We both felt that there needed to be more interaction between the players. Overall it was a great first play test. It went about as expected in that the game was unbalanced and not too playable. And we got to figure out REAL quick a few mechanics and keywords that were just not fun at all. I will post in a bit with more of our individual thoughts about the playtest along with a few more pictures. 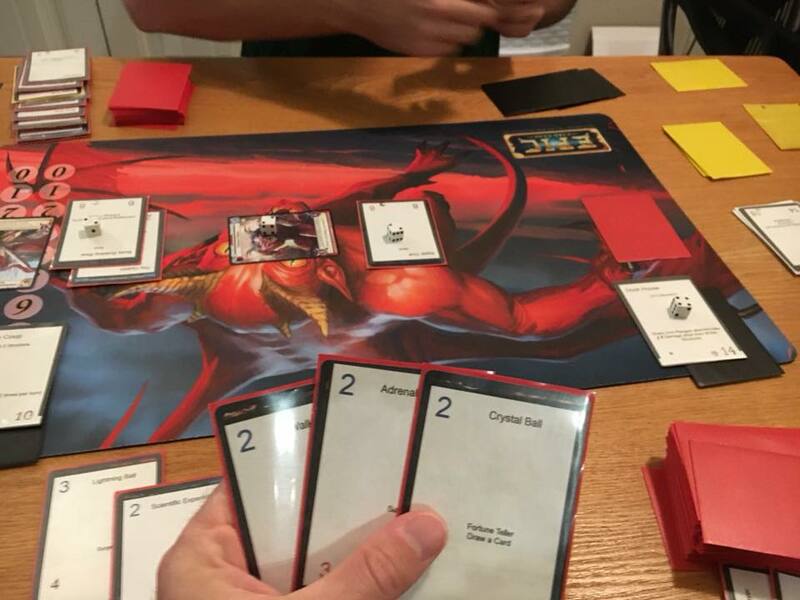 (6/2) What I learned from the first playtest of Memaw’s Monsters. Towers that didn’t attack but instead did damage back to melee attackers were uninteractive and boring. We really liked several keywords in the game while finding about 1/4 of the keywords were clunky and/or not fun. I plan on focusing on the fun keywords in future cards while removing the boring ones. Giving monsters and/or towers activated abilities might be a fun addition but will bring complication to the game and interrupt the flow. I plan to keep this in mind while designing cards and may try some cards with these mechanics to see if the fun is worth the interruption to flow of the game. We want to add “trap” cards but are still trying to figure out how they will work. We’ve brainstormed several options and I will make some test trap cards to try out. I want to make the main boss even bigger and better in hopes the game lasts 2-4 turns after the boss is summoned. Defense cards are way too weak and will buff most/all of them. It was overall a REALLY good first playtest. The game was unplayable as a whole but that is expected on first playthroughs. Tonight I am updating the defense cards and am adding trap cards. I look forward to our second playtest!! (6/3) Intentionally making overpowered and underpowered cards. I have noticed that some of the cards I’m thinking of are intentionally made stronger or weaker than I think they should be. I will have somewhat of a range of power levels of a given card type which will help me figure out what the appropriate power level should be. Hopefully it will mean I won’t have to update as many cards after each playtest. If I make both the offense and defense have a wide range of power levels then this would skew the results. For example, the offensive player draws all of his weak monsters while the defensive player draws all overpowered cards. To prevent this from happening, I should only experiment on one players power level at a time (either test out the offense cards only. Or the defense cards only. Not both at the same time). I’m hoping to get another round or two of testing today. But if I need more time to update the cards, then I will probably have to wait a few days or until next weekend. (6/3) My brain hurts after a helpful second round of testing and a long weekend of progress on the game. The 2 player asymmetrical tower defense card game I have been working on for weeks now finally got play tested this weekend. Twice. Both playtests taught me a lot. Honestly, my brain just hurts and is tired from all of the thinking. I think it would be best to set the game aside for the night and probably even work on something else creative tomorrow. At least for the first part of the day. I realized I can now increase the power level of the mini bosses and main bosses. I’ve been wanting to do this for a few days now and since the defense is stronger, I can upgrade the bosses. The bosses should be remembered by players and heavily focused on from a design standpoint as I think this will make for a more enjoyable player experience. Making a prototype is hard. Balancing it is just as hard if not harder. I had forgotten just how difficult this was. Overall I am happy about the progress that was made. Even with just 2 playtests and about an hour worth of game time. 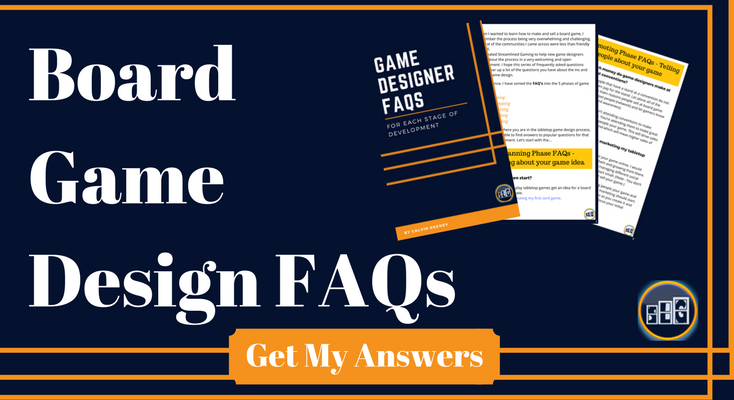 I’m excited about all of the design opportunities that the core of my game offers and I was extremely happy for how the game “felt” as I played it. My gut tells me that this could be a great game and enjoyable by both competitive and causal card game players. Only time and more testing/balancing will tell though. Most of the day I relaxed and took some time to myself after a long sprint of working really hard on the game. I realized that I had been going nonstop with the game along with life itself. 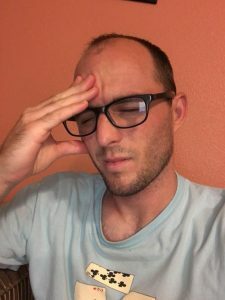 When I notice my brain and body getting tired, it’s important for me to accept that and take the appropriate time to care for myself (both mentally and physically). This is important to not only the progress of my game, but for my health in general. It’s hard enough to create something awesome when I’m healthy. And impossible when I’m not. I’m worried it will sound like I’m complaining. I want to choose positivity over negativity on a daily basis and fear talking about negatives will hinder my efforts of spreading positivity. And because it’s not really fun to talk about (along with it being difficult to feel vulnerable/weak). It’s not complaining if I’m just writing to document the normal feelings I have when creating something fun like a card game. I can still choose positivity over negativity and encourage others to do the same. 1 out of 20 posts about normal “not happy/excited” feelings is ok.
And finally, I remember that it’s ok to be vulnerable and weak. Both physically and emotionally at times. In fact, it’s probably MORE healthy for me to admit to myself that I am in a slump. That way I can be more effective at figuring out ways to come out of the slump. So what did I do to come out of the slump? After taking several hours to myself I was ready to do something fun again. What did I pick you wonder? Well…. I played a round of Memaw’s Monsters Tower Defense by myself and against myself!!! hahah. This time focusing on just having fun playing the game. Nothing more. It’s funny to me that working on the game can both wear me out and at the same time be a nice relaxing and joyful experience for myself. Realizing that I didn’t have to “get the game complete today!” was helpful. This eased my mind and I was able to go back to enjoying the process opposed to feeling overburdened. Anyways, hopefully this post wasn’t too draining. I’m wanting to capture some of the more difficult times that naturally come with any creative process I will try. Game design is no different. Thanks for reading as always and I hope your week has started off well! P.S. Another reason I’m excited to include these “less fun” things in my experience is that I think it will be super interesting to look back on. Remembering both the good times and bad.